JLA Music - The Gal With the Golden Git Knocks 'em Dead With a Killer Workshop On Guitar Care! The Gal With the Golden Git Knocks 'em Dead With a Killer Workshop On Guitar Care! It is a dark and dreary night. Cold, damp air crushes through the nostrils, weighing heavily on the lungs. Faintly, in the distance, the sound of a guitarist playing the James Bond theme wafts through the turbid air. Spastic bolts of lightning animate the darkness, leftovers from an earlier thunderstorm. Jody Love, a tall, muscular woman with soft facial features, boldly makes her way down a deserted city street. With a look of determination in her radiant eyes, she's on her way to present a workshop on guitar care at a local convention. Her shoulder-length golden locks bouncing in lockstep with her steadfast gait, she is dressed for the weather, wearing a yellow nearly-see-through rain jacket and rain boots. Just barely visible underneath, a form-fitting thigh-length yellow dress neatly clings to her flattering figure. In her left hand is a folded compact umbrella – yellow – in her right, a guitar case – gold. A lesser person would have trouble carrying the sturdy-looking rectangular guitar case, but she navigates it with ease. It's a NivilTM brand case, doubly padded with waterproof joints, and sporting triple-locking mechanisms fortified with Teflon extrusions and spring-loaded shock-absorbing bumper guards. For extra protection, the case is enclosed in a waterproof, transparent, flexible overcoat. Clearly visible through the overcoat, and printed in bold black letters, is the phrase "Model 0007, Special Order Design #BXZ1000, 21st Century Survivor SeriesTM Guitar GuardianTM. 'If it ain't a NivilTM, it ain't a livin!'" Jody Love is well known in guitar circles as the official spokesperson for NivilTM brand guitar gear. NivilTM is the brand of choice for gigging musicians everywhere on the seven continents. (The Brits – Jody Love one of them – claim there are only six.) She tours the world giving lectures on guitar care, doing live concerts, and - it is widely rumored, though unproven – performing undercover work as a spy for the British government. It is said that she has a license to kill – a perfect image for the Princess of Love-Death-Metal, the genre she single-handedly defined through the twisted amalgam of her softly sensual feminine physique mixed with killer guitar riffs. The contents of her guitar case – aside from her guitar (her Jody Love artist-model white and blood-red Flying-V) – are a carefully guarded secret. Whenever Ms. Love removes the guitar, Mr. Condor - her buff bodyguard, confidante, and long-rumored lover – makes sure the case is locked and gripped firmly in his muscular hands. The case features an elite 1024-bit encryption, dual eye-and-fingerprint-scanning lock – a device used by high-level government officials and wealthy aristocrats. Having arrived at her destination, Ms. Love prepares for her workshop presentation. She gracefully disrobes her rain gear, fully revealing her stunning and alluring dress. Nimbly crouching down to open her guitar case, she removes her guitar, stands up, and holds it to her chest. After attaching the guitar strap to the top of the guitar, she throws the strap with élan over her left shoulder, catching it as it flows around her right side. Effortlessly attaching the strap to the bottom of her guitar in an instant, she shakes her hair loose, and lets the guitar hang limply from her statuesque body. She looks utterly breathtaking, a mesmerizing meld of woman and guitar. The beauty of her façade, contrasted with the dangerous angularity of the guitar, forms an otherworldly silhouette. Though she is far away from the audience that is gathered for her guitar care workshop, it is clear they have spotted her just as she has finished her preparation ritual. Their noisy banter immediately drops to a single astonished collective hush. Ms. Love walks confidently toward them, each step like a knife being driven into the hard wood floor. Arriving at the stage, she confidently steps up to the pedestal, looks directly at the audience, and presents the look of someone who has stared death in the face and won with malice. Every member of the audience has a look of absolute awe, with a subtle hint of prescient, unconscious foreboding. A comment from the audience breaks the steely silence. Ms. Love, may I say that you look impeccable today! The French words fit her voice – soft, yet striking. They almost disguise her subtle British accent. Another member of the audience chimes in. Your guitar looks impeccable too, Ms. Love! How do you keep it in such good condition? Ms. Love: I treat it with tender loving care. Get it? Lov-ing care! She pauses, expecting a response . . . Getting none, she continues, somewhat emphatically, nearly Valley Girl-like, with an American accent. Like, you know, my last name is like, Love, like, you know?! The audience finally grasps the joke and laughs heartily. She goes on speaking once she's taken the time to bask in the rays of approval emanating from the audience, returning to her light British accent, now with more weight. But seriously, it is love that you give your ax. Ms. Love continues without acknowledging Mr. Condor, in a vocal tone more dramatic, with the pregnant pauses typical of an accomplished Shakespearean actor. But what is love? 'Tis not hereafter. Present mirth hath present laughter. What's to come is still unsure. So . . .
She forms her lips nearly in a kiss as the audience expects to hear "come kiss me sweet and twenty", the rest of the Shakespeare sonnet. Events seem to occur in slow motion. Mr. Condor is transfixed by Ms. Love's slowly-moving lips. It is a moment of ephemeral magic. But Ms. Love lets her mouth form words instead of a kiss. Events are back in real time as Ms. Love continues speaking, now less dramatically. To put the Shakespeare quoting to rest, [Mr. Condor looks disappointed] it boils down to several critical things. The audience expects to hear a long lecture on guitar care, but something happens that abruptly changes everything. The James Bond theme rings out lustily from a cell phone, shattering the mood. Audience members look around with shock and embarrassment on their faces, worried that one of them forgot to turn their ringer off. They are all surprised when it is none other than Ms. Love who puts a cell phone to her ear. (Who else would have a James Bond ring tone?) The audience looks at one another quizzically, wondering what could possibly merit the attention of Ms. Love in the middle of a workshop. After a very brief phone conversation punctuated with two-and-three syllable answers from Ms. Love – "Yes ma'am." "Of course." "No delay." "On it." – she puts her phone away and gives Mr. Condor a look of urgent surprise. Something is afoot. With an impatient voice, Ms. Love speaks to the audience. I regret to inform you that I must leave unexpectedly, before finishing the workshop. But here - let me give you a handout that I prepared earlier. 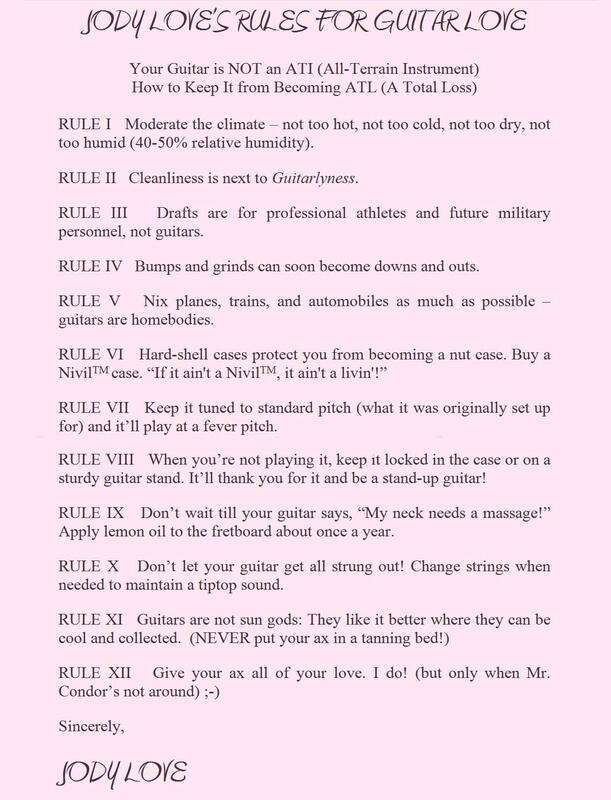 It will explain everything you need to know about caring for your guitar. Ms. Love hurriedly picks up a stack of papers from a nearby table and awkwardly hands it to the nearest member of the audience, nearly dropping the bundle on the floor in her haste to embark. I'm sorry that I must rush off so quickly, but I've been given an assignment, er, ah, I mean, a rehearsal. The glitch in Ms. Love's words hints that she is not being totally forthcoming. Four people shout from the audience - with Gatling gun urgency - questions that are on everyone's minds: "Are you a spy, Ms. Love? Is there a weapon in your guitar case? Are you an assassin? Are you rushing off to a kill?" Ms. Love stands still, perhaps unsure of how to respond. Mr. Condor, obviously nervous as a result of these pointed questions, motions emphatically to Ms. Love that they must leave immediately. Ms. Love takes Mr. Condor's cue and hastily makes one last comment to the audience. I'm sorry I have to leave. Thank you for coming. She turns to face Mr. Condor. She quickly dismounts her guitar, presents it to him, and speaks sternly in a subdued voice. My guitar in the case please - at once Mr. Condor! We mustn't be late! It's urgent! Mr. Condor quickly secures the guitar in its case, then hands the case to Ms. Love. She abruptly but elegantly turns and walks away, golden guitar case firmly in hand, waving back with a backward glance of her arm and hand as the audience breaks into fits of spackled uncertain applause. Once Ms. Love and Mr. Condor are gone, the applause quickly dies out. Members of the audience share the handout with one another. They speculate in hushed tones about where Ms. Love is headed and what she will do there. Although astonished at the unusual content and brief length of Ms. Love's truncated workshop, they are impressed with her appearance and appreciative of the handout's contents. What really happened that day after Jody Love left? Perhaps she had to answer to an urgent request from the Queen. Did she use her license to kill while protecting the Crown from the perils of impertinency and malevolence? Who knows? It is likely that the truth will never be told. Barring an answer, it is best to be content with having witnessed one of the greatest guitarists of our time, a truly singular original, give an appearance of a sort that, short and imperfect as it was, may nevertheless rarely be surpassed. Jody Love left us longing for a future engagement where she will again dazzle with her presence. Will it be sooner or later? Sooner, hopefully, for some cannot live long without her spectacle, and, sadly, her spectacle cannot long live. But, in the meantime, one should relish the thought of her next apparition.